What's that Pain Going Down Your Leg? If you think any and all leg pain is sciatica, you may want to think again. It's true that sciatica has a number of possible causes, but symptoms are generally limited to radiating pain and other sensations that are felt in buttocks, hip and leg. 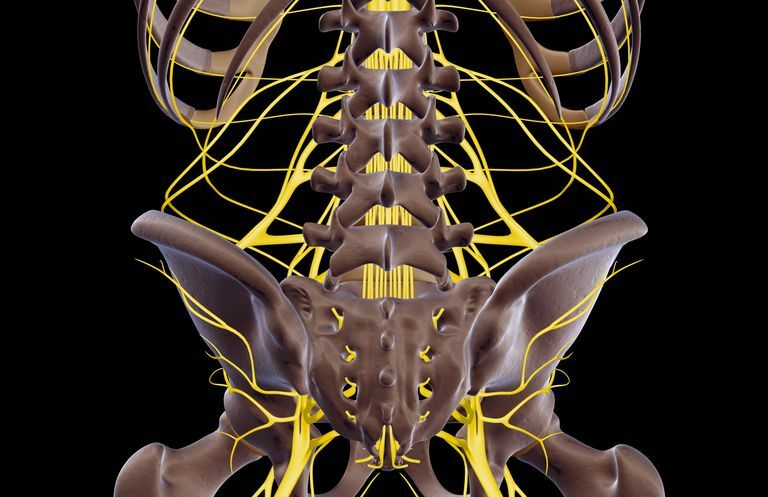 Beyond the pain, sciatica symptoms may include nerve related sensations (or lack of them) such as numbness, weakness, and/or electrical type feelings. These are also experienced in buttocks, hip, leg and sometimes even the feet and toes. The electrical sensations may be as mild as pins and needles, or very intense; they may also come the form of burning, shock, shooting pain and the like. Low back pain sometimes accompanies sciatica, and sometimes does not. The most common cause of sciatica is an impingement or irritation of a spinal nerve root, and goes by another name, radiculopathy. Usually a herniated disc is the source of the impingement, but spinal stenosis, where the area through which the spinal nerve root normally passes, becomes blocked by arthritis related enlargements of the bone, or spondylolisthesis, where a vertebra slips forward or back of the spinal bone beneath it, may also bring about sciatica. Pregnancy, where the developing fetus puts pressure on the sciatic nerve, is yet another potential cause. And finally, piriformis syndrome, which occurs when a tight buttock muscle, aptly named the piriformis, entraps the sciatic nerve, is another condition that may give rise to sciatica symptoms. Initially, sciatic pain may be mild, but over time, the intensity may grow, sometimes to unbearable levels. Although it is possible to have sciatica on both sides of the body, the pain is usually felt on one side only. This is because, again, spinal nerve roots that become irritated are usually the cause of what most people call sciatica, but is known to doctors and other experts as radiculopathy. Anatomically, spinal nerve roots come in right and left pairs, but pressure put on them tends to happen asymmetrically, that is, on just one side per level affected. More rarely, sciatica symptoms may develop into numbness or paralysis in the buttock area. Called saddle anesthesia, this is a sign that likely something serious is going on. If you think, based on your symptoms, that you have saddle anesthesia, especially if they are accompanied by disrupted bowel and/or bladder functioning, seek immediate medical attention. Saddle anesthesia, bowel and/or bladder dysfunction and/or progressive weakness of the legs are all signs of cauda equina syndrome. Cauda equina syndrome is very serious and considered a medical emergency. Treatment for symptoms of sciatica generally focus on conservative therapies first. This may mean taking medication plus going to physical therapy, where you'll be given a home exercise program to do on a daily basis. The exercises you'll be asked to do will likely vary according to what is causing your symptoms. For example, if your sciatica is caused or made worse by spinal stenosis, one of the exercise goals your therapist may establish for you is increased strength in your lower extremities — as a way of making up for the loss of spinal extension that tends to accompany this condition. Regardless of the cause of your sciatica symptoms, though, it's always a good idea to work in a pain free zone when you exercise. Many people have surgery for their radiculopathy symptoms, which as we've said, is the most common, but not the only type of sciatica. A discectomy is a very common procedure for this and works well for many people. That said, a 2016 study published in the European Journal of Pain asserted that while surgery is associated with a rapid decrease in pain and disability, this tends to be a short term outcome. The researchers found that many patients still had mild to moderate pain and disability even five years after their spine procedure. According to National Institute of Arthritis and Musculoskeletal and Skin Diseases, or NIAMS, if sciatica symptoms are caused by a slipped disc, specifically, a disc that is bulging past the normal boundaries of the spinal vertebra or vertebrae to which it is attached, symptoms often go away on their own in about 6 weeks. NIAMS estimates this is the case for about 90-100% of people whose sciatica symptoms are related to a slipped disc. After 6 weeks, the odds of symptoms dissipating on their own decreases, which may necessitate a course of physical therapy and/or surgery, they say. Fact Sheet: Slipped Disc and Low Back Pain. NIH. NIAMS.. June 2017. Kendall, F., McCreary, E., & Provance, P. (1993). Muscles: Testing and Function with Posture and Pain. Baltimore: Williams & Wilkins. Machado, G., et. al. Patients with sciatica still experience pain and disability 5 years after surgery; A systematic review with meta-analysis of cohort studies. Eur J Pain. Nov 2016. Wheeless' Book of Orthopaedics. Sciatic Nerve. Duke Orthopaedics web site. April 2012.